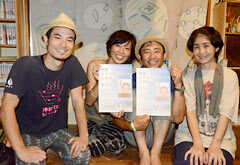 The members of "Yomitan Re: Peace Ranger": (from left) Takiro Kinjo, Yuriko Mimura and Ken Mimura, Mika Yamaguchi in Yomitan on June 30. Kinjo, who runs a restaurant in Yomitan, feels that something is wrong with the way that people avoid discussing constitution and politics. Some say that discussing these topics is too serious and daunting. 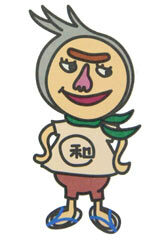 He feels uneasy because recently the media have been discussing amendments to the Constitution. In the organization’s name, “Re: Peace” means recreating peace. They plan to hold events that young people will be able to easily take part in, such as films and book reading. The organization now wants to attract “rangers” who agree with its purpose no matter where they live. On July 20, they will set up a booth introducing books that explain the Constitution in easily understandable terms. The door opens at 6:30 p.m. and the movie starts at 7:00 p.m. The admission fee is 900 yen, but people aged 18 or under enter for free. Because of the nature of the venue advance reservations are required. For reservation and enquiries, call the organizer at 090 (4779) 1080.